a new multi-year, part-time Atelier designed to confer the core disciplines needed to become a practicing figurative sculptor at a high level of excellence. 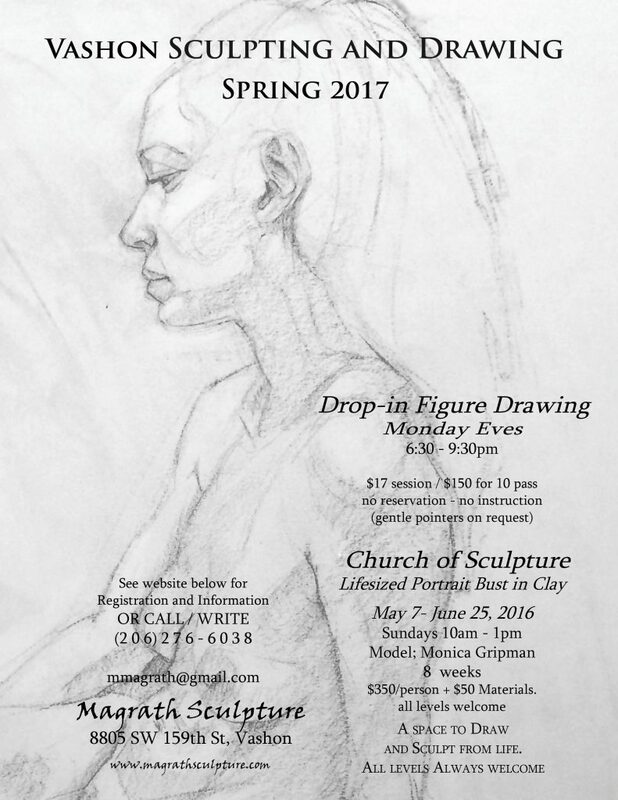 Sunday sessions at the Church of Sculpture will resume on May 7th and continue 8 weeks until June 25th. This is a place to practice sculpture and drawing from real life in a relaxed atmosphere from 10am-1pm. This Quarter we will focus on a Lifesized portrait in Clay. We will work with one model for the entire session. Our model will be our own 80’s international supermodel Monica Gripman – We welcome both returning and new students this session who want to try this fun, intuitive and direct method of figure sculpting. RSVP to reserve a spot! Our regular Monday Eve Open-Studio Drawing sessions continues as always. 6:30 – 9:30pm A great way to drop into observational study and build your innate aesthetic sense. No reservation or notice needed. Easels, models and music provided. Bring your own drawing kit. $17 per 3-hr session (to cover the model’s fee) or $150 for a 10-pass. During the summer months, we occasionally offer intensive workshops for various aspects of sculpture, portrait drawing, and mold making.